Update: Mesob closed in late 2013, after developers acquired the surrounding property to build townhouses. The owner has opened a new restaurant called Shewaber at 1221 S. Main. 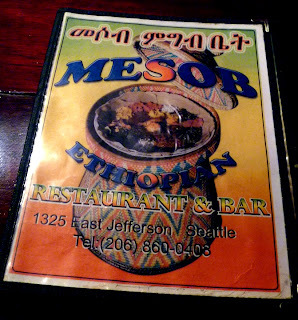 Mesob has been around about ten years selling some of the better Ethiopian food in town. 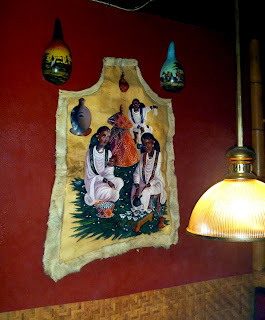 The treat is the bar in the back room, which has an island/tiki feel to it, due not just to the raffia roofs over the bamboo booths, but also the ramshackle, low-budget extension to the building that houses them. The cocktails are nothing to write back to the mainland about, but you can sip them in a pleasantly casual vibe, with the smell of spices and incense wafting through the air.